Almo Nature - Cat - HFC Natural is a cat food made from pure ingredients. Almo Nature HFC is a "single serve" meal in a convenient 55g pouch which can be served directly into your cat's food bowl. This HFC and flavourful meal is composed only of pure ingredients and contains a high percentage of meat and/or fish. The fish is not farmed but freshly caught from the sea, and the meat is free range and free from hormones and antibiotics during breeding. The meat is cooked and processed without additional chemicals and preserved in its own cooking juices to keep in valuable nutrients, and is rich in natural vitamins and minerals. To complete the meal, a small amount of rice is added; this makes the meal a healthy and responsible choice. Meals from Almo Nature contain no chemical preservatives or colourings to improve the appearance and flavour of the food. The simplicity and authentic taste make these meals extremely popular with cats. 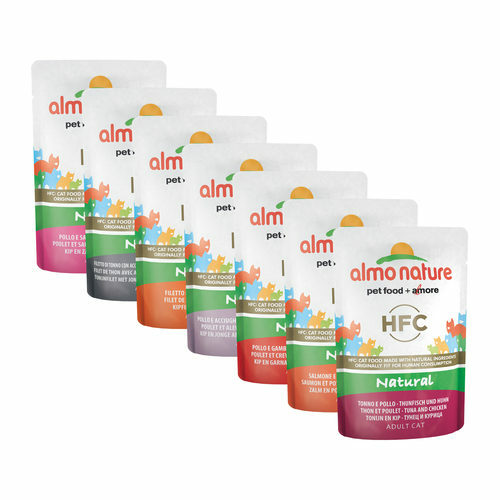 Almo Nature HFC 55g is packaged in 24 pouches weighing 55g each (24x55g), and there are 7 flavours available. Have you used Almo Nature - Cat - HFC Natural before? Let us know what you think about this product.